See, Garmin, now this is a reason to release new GPS navigation units and not because you are increasing the screen size by half an inch. 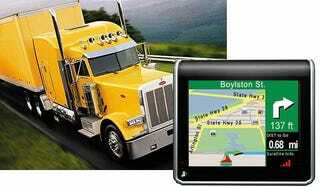 The WorldNav 3300 GPS navigation systems from TeleType cater specifically to drivers of hazardous materials and truckers. You know how some roads don't want your uranium or toxic sludge traveling down the road? This is here to help you out. The two GPS navigation units do more than just route for hazardous materials. They allow you to enter in your big rig height, weight and length. It will direct you on the best route for your big rig and also take into account the commercial truck restrictions of all types.